Theme: This elastic has an improved quality over other brands that can be visually seen and experienced!,Soft & comfortable next to skin. 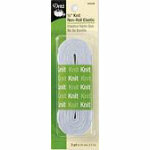 Will not narrow when stretched.,Use in casings or stitch directly onto fabric.,Size: 1/4" (6.35mm). 3 yard package.